There are certain times when, as a reporter, you conduct an interview that truly allows you insight into the artist you are profiling -- that provides you a better understanding of the music the person creates and the motivation behind it. 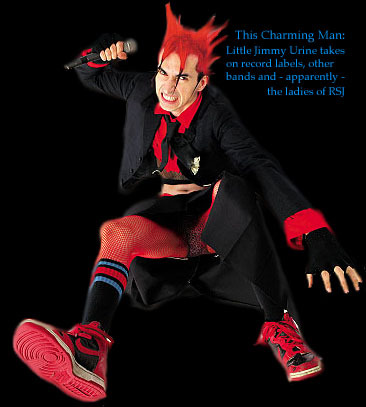 The ladies of Rock Star Journalism certainly feel that we had just such an experience, as we gained a much enlightened perspective on Mindless Self Indulgence after our interview with their frontman, Little Jimmy Urine. So as to convey this experience to our readers, we've reprinted what we received via e-mail exactly as it was sent to us. Welcome to the world of MSI. 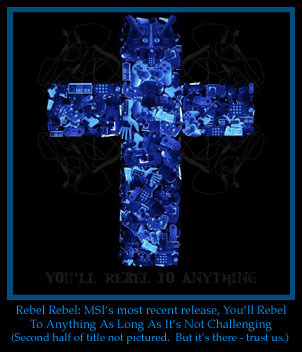 Rock Star Journalism: You are about to release the first MSI album in five years. Why the long break since Frankenstein Girls? RSJ: Why did you choose to release the new cd in three different formats? RSJ: In what ways would you say this album differs from Frankenstein Girls? RSJ: When you began work on this album, was it completely spontaneous or did you already have an idea of what direction it would take? RSJ: You've titled your new album, You'll Rebel To Anything. Is this a commentary on the music that is viewed as rebellious by today's standards? RSJ: Do you think it's possible to be shocking or rebellious anymore? RSJ: You've had problems with record labels in the past. How did you get involved with Metropolis? RSJ: Censorship has been an issue you've had with past labels -- were you given complete freedom with Metropolis? RSJ: You said in a past interview that in New York you "don't really fit in with the industrial and goth kids." However, you're now on a primarily industrial/synth label. Why do you think that the industrial/goth community has taken to you over that past couple of years, and shown so much support? RSJ: You released the Left Rights cd on your Uppity Cracker label. Have you signed anyone else recently? RSJ: You have an ad for submissions on the Uppity Cracker website. What are you looking for in a band that you'd consider signing? RSJ: When talking about record labels, you mentioned that parent companies don't care at all about the labels they own. Do you think that if more people went out on their own and started labels and did things independently that the music industry might begin to see a turn around? RSJ: I've seen your out of print debut, Tight, sold for as much as $150 on the internet. Do you have any plans to ever re-release this album? RSJ: You recently worked with Jhonen Vasquez for your new video. How did you get involved with him? RSJ: How did the video shoot go? JU: GREAT...HOW DID YOURZ GO? RSJ: You've emphasized the need to be original in the past. Do you think that's getting harder, as the blending of styles, specifically the electro-punk combination, is far more common today than it was in 2000? 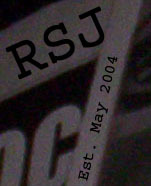 RSJ: You have made statements about how you felt that there was nothing really interesting happening in music during the height of nu-metal. Now that that era is over, do you still feel as though there is no true innovation? RSJ: You also mentioned that "people don't want music to change." Why do you think this is the case? When it changes, as all things do, where do you see it going? Where would you like to see it go? RSJ: You've stated many times that you don't consider yourselves "musicians." What's the difference between what a musician does and what you do? RSJ: In researching for this interview, I noticed you'd been asked several times about drug use, and have always answered that you don't use drugs of any kind. Do you feel that being a performer vicariously makes you a role model for fans? Do you feel this is an unfair responsibility handed to performers, when people should make their own decisions? RSJ: For a band that's never had a traditional radio hit, you've developed a rabid following. How do you think you've won over so many fans? RSJ: Having toured with ICP, another band that has a huge underground fan base, do you see any similarity between how they developed a following and how you have? RSJ: Do you think you would want mainstream success if it were offered to you? RSJ: You described the ICP tour as a learning experience -- what was the most important lesson you took from it? RSJ: Most of your fans are familiar with your outrageous live shows. If you had to pick one, what show would you choose as your most memorable? RSJ: Having said that, much like Andy Kauffman, you "set out to create a reaction," do you see the reaction of your audience also as an art of its own? RSJ: Do you ever feel like you have to continuously top yourself with the live antics to meet people's expectations? RSJ: What was the first live show you saw that really impressed you? Why did this band make such an impression? RSJ: You'll be hitting the road again in April. Do you have anything new planned specifically for this tour?